Lately it seems like everyone in New York City has the sniffles, including me. A stubborn cold is going around, and I’ve been trying to shake it for over a week. When DayQuil and NyQuil fail, it’s time to bring out the big guns; it’s time to head to The Mill for some spicy and satisfying Korean food. I think of The Mill as a little gem in Morningside Heights. It’s really the only authentic Korean food around on the UWS, unless you want to hike down to K-Town. My Trusty Sidekick and I love coming here (even when I’m not under the weather) because the food is fresh, the portions are huge, and the service is fast. Best of all, it’s cheap. For a quick, inexpensive dinner, it’s hard to beat The Mill. 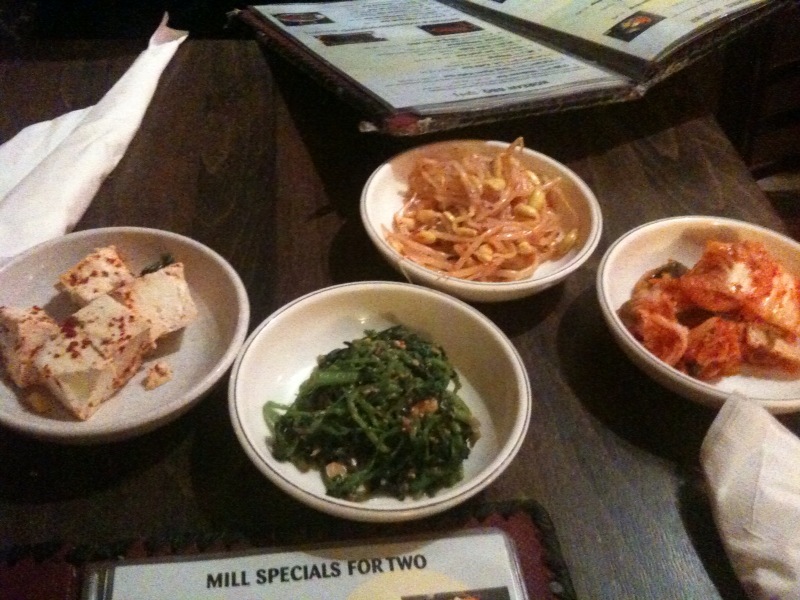 The four complementary Banchan (small dishes) at The Mill are always fresh and constantly changing. Food: As soon as you sit down four bowls of complimentary side dishes, called Banchan, will arrive, followed by a small bowl of miso soup. These dishes always make me smile–they’re fresh and constantly rotating. Trusty loved the spicy kim chi, while my favorite was the chilled, spicy and silky tofu. It was a great way to start the sinus-clearing meal. 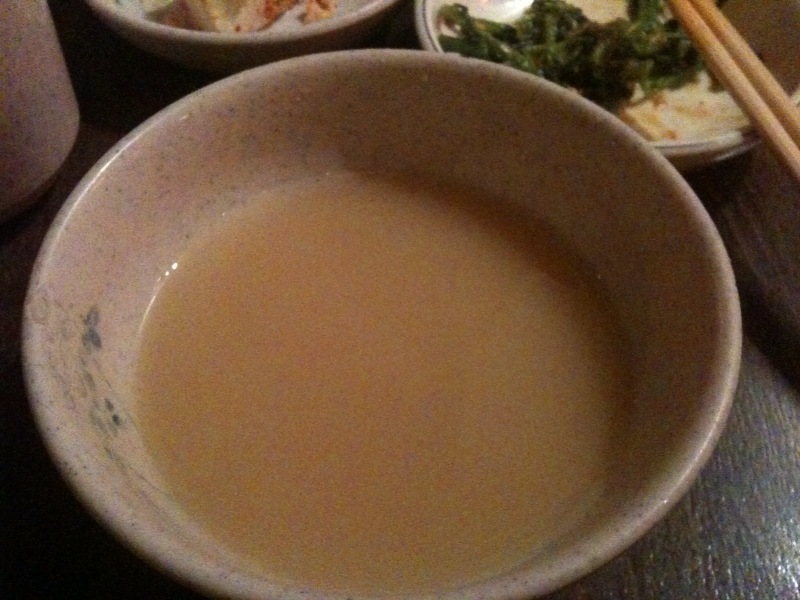 Nothing like a rich, comforting Miso soup when you're sick--especially when it's free! 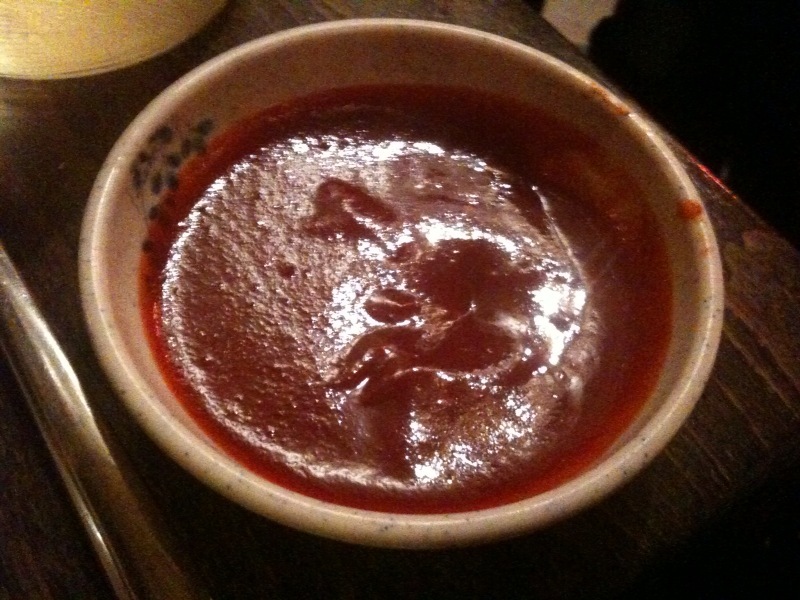 Magical, addictive chogochujang, a thick, sweet and very spicy sauce that's like a Korean version of ketchup. I usually order Hwae Bibimbap ($12), which is a cold bibimbap (served in a stainless steel bowl instead of a hot stone pot) with assorted julianne vegetables and pea shoots, strips of slightly salty and sweet dried seaweed, julianne Fuji apple slices, and chunks of fresh, raw, sweet tuna or tilapia, all over warm white rice. I love all the flavors and textures in this dish! 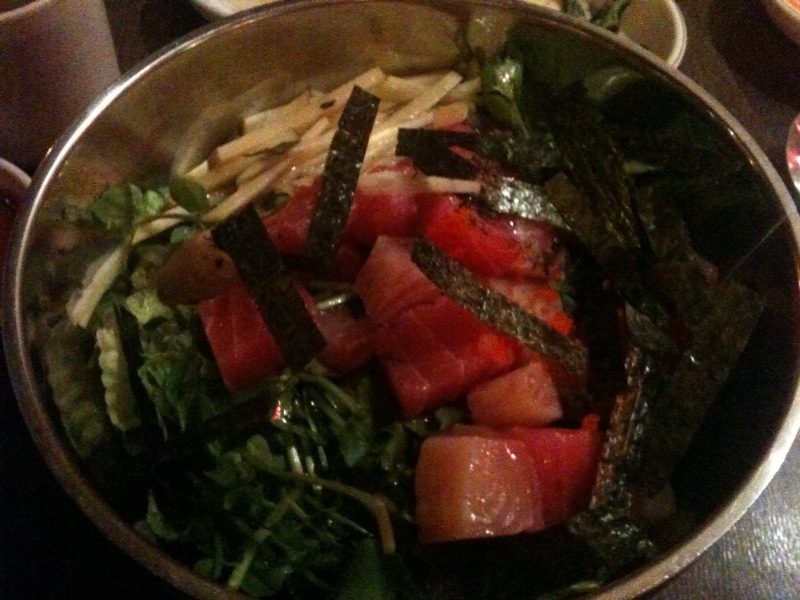 This dish combines all my favorite flavors and textures–I love the cold, sweet, raw tuna and tilapia with the warm white rice and the sweet and crunchy Fuji apples with the veggies–crispy lettuce and pea shoots dressed in nutty sesame oil–with the salty and slightly sweet seaweed–mmm. Tons of fresh, delicious ingredients that only get better with the spicy, sweet and vinegary chogochujang sauce. Yum. I love the huge portions. The bowl is always way too big for me to finish! 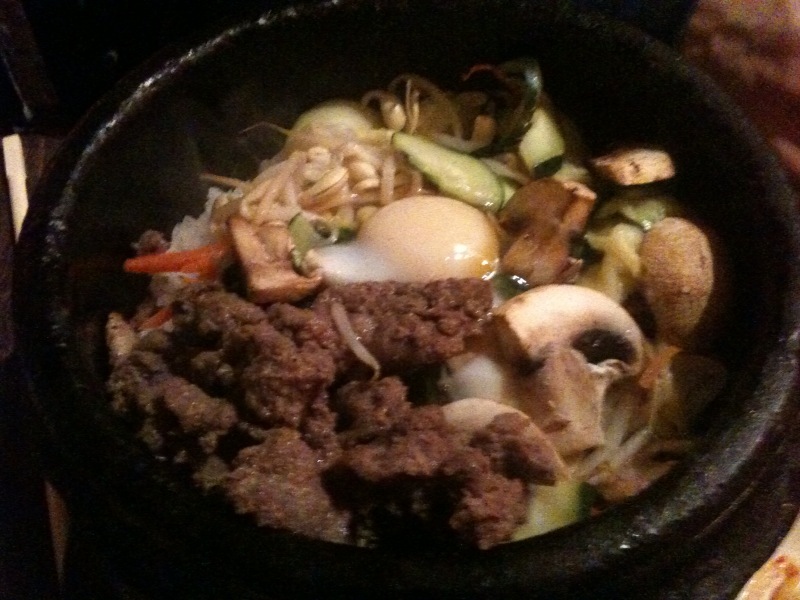 Trusty always orders his favorite bibimbap, which is Mushroom Dolsot Bibimbap with Beef. It’s loaded with mushrooms, other veggies like bean sprouts, carrots, and zucchini, and strips of seared beef. 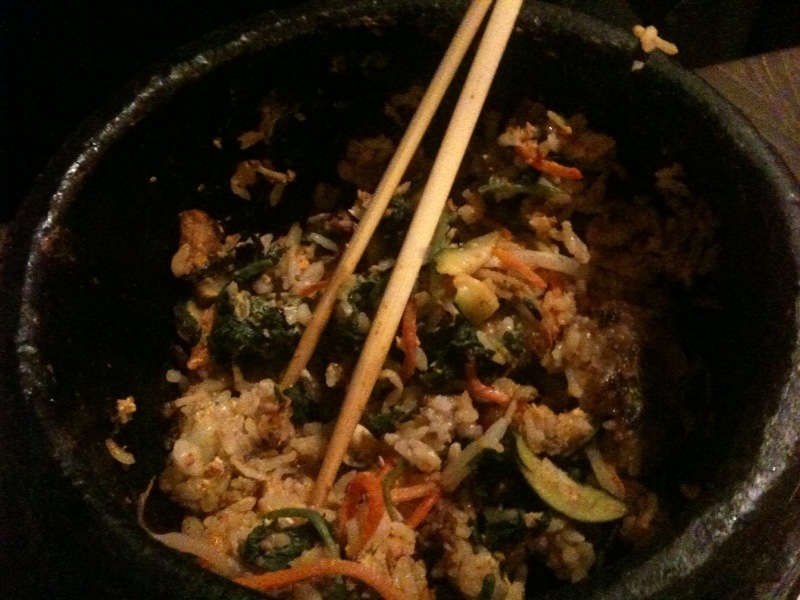 Trusty’s bibimbap arrives in a piping hot stone pot, and when he mixes all the ingredients together the heat of the pot scrambles the fresh uncooked egg. 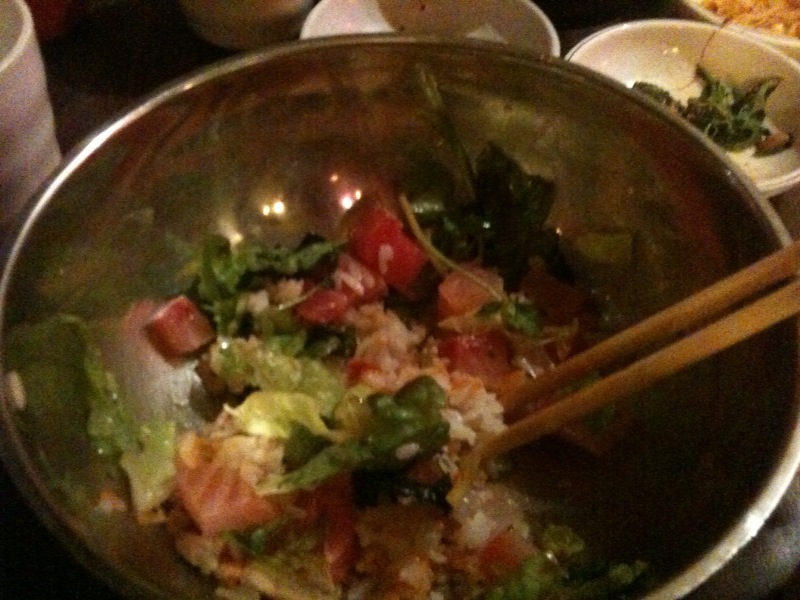 The bowl is so hot that anything that touches it sizzles for minutes. Before the rice is added to the pot, the bottom is coated with a yummy, nutty sesame oil, which makes the rice at the bottom of the pot deliciously golden brown and crispy–one of Trusty’s favorite parts of the dish. Even Trusty can't finish his whole pot. Drink: We usually order tea, which is a basic, but delicious jasmine. For my sick throat, it was especially good. If you’re in the mood for something else, The Mill also offers soft drinks, a selection of Asian brand beers, and cold sake. Service: The service here is fast, but impersonal; the no-fuss service here takes a back seat to the food. Expect to be seated immediately and expect your food to arrive within five minutes after you’ve placed your ordered. But, don’t expect any chit chat from your waiter. You may find the staff to be practically wordless–often food arrives without any explanation–but (I think) the food speaks for itself. Scene: The restaurant is a small, simply decorated space. 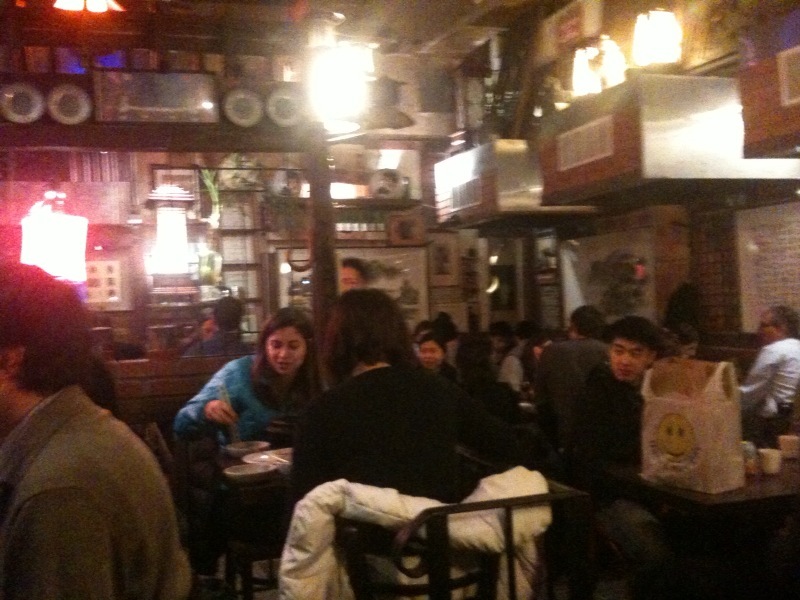 Framed Korean prints and old scrolls hanging on the walls give the interior a cozy, authentic ambiance. If there’s an open table in the back, asked to be seated there–you can peek into the kitchen and watch the kitchen crew roll dumplings by hand. Dress: The Mill is pretty firmly in Columbia University territory, so casual dress code is more than appropriate. Jeans, t-shirt, whatever. Cost: Our check came to $30 with tax and tip. A great price, and for the amount of food we got, it was especially reasonable. Delivery: Delivery available from 95th to 125th St Riverside Dr. to Morningside Dr. $8 minimum.